Unexpected surprises that I loved: Airport pick-up, loaner car service, RV starter kit, lots of smiles and helpful information. The salesman, finance & closing team and walk-through person were all excellent. Thank you. 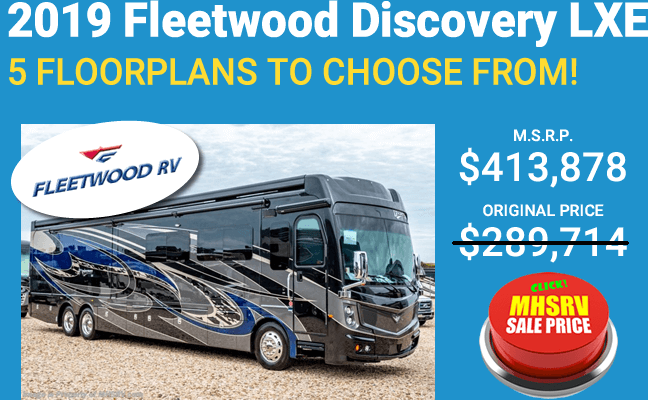 From the first time buyer to the life time enthusiast to everyone in between, the Coachman Mirada and new Coachmen Mirada Select has a little something for everyone. 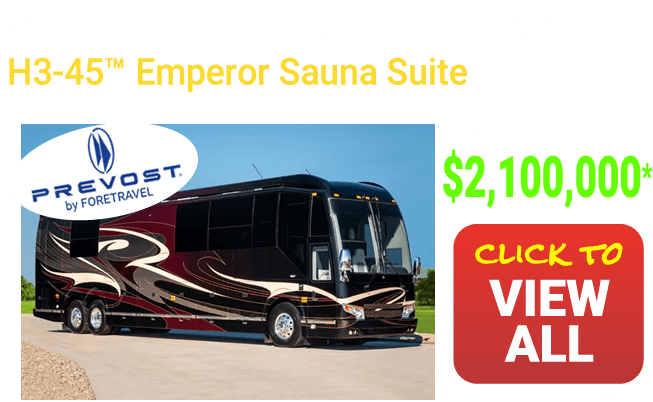 This coach comes with a long list of standard features and some great optional ones as well.  No matter what you are looking for, you likely find it here in the Coachmen Flagship class A gas models. Keep Your Eye on the Coachman Mirada and Mirada Select. With its stellar looks, it will be hard to look away from the Coachman Mirada line-up. 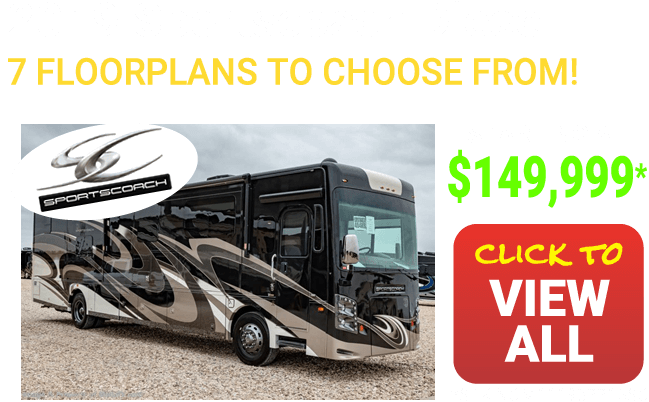 From the available colored fiberglass with partial paint and vinyl graphics to the available crowned and laminated fiberglass roof, and all the way down to the rear mud flaps, this is one good looking motor coach. The interior pulls its weight with a choice of wood color selections as well as available antique nickel hardware and Corian kitchen countertop. No matter where you look, you are going to like what you see in this coach. 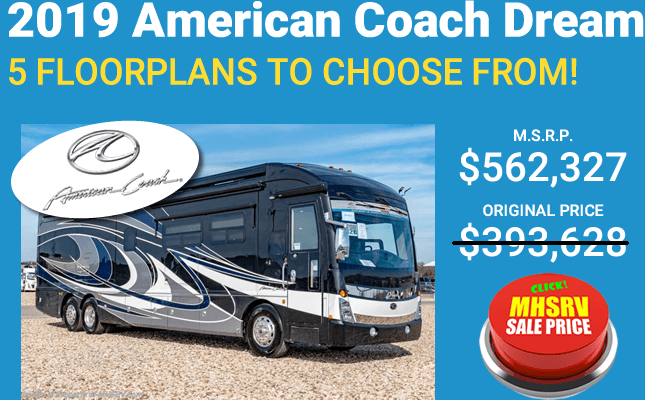 Spend Less for More with the Coachman Mirada motorhomes from the ultimate Savings Destination of the RV World, Motor Home Specialist. Comfort doesn't simply come in the form of soft sofas and beds, although the Coachman Mirada and Mirada Select have both. Comfort also comes with having automatic leveling jacks and the right air conditioners. In most cases, two units featuring Coachmen's Even-Cool duct work. Speaking of comfort, do take the time to sit back and enjoy the large TV in the living room as well as the optional TV in the bedroom. Additional features may include: Ball bearing drawer guides throughout, L-shaped sofa lounge, High rise kitchen faucet. Bring More to the Road with the Coachman Mirada and Mirada Select. 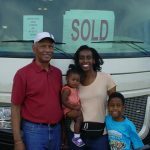 When you make the decision to spend your time in a motor coach, you want to ensure you select the right one for you and your family. Time has shown that you can't go wrong with the Coachman RV, who has been making iconic motorhome brand names since 1964. 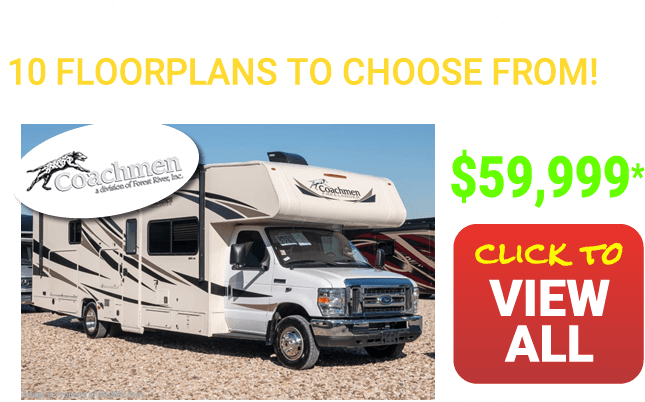 Be sure to also check out the other Coachmen Class a motorhomes including the Coachmen Pursuit and even their diesel pusher RV lineup that includes the Cross Country and Cross Country SRS models. 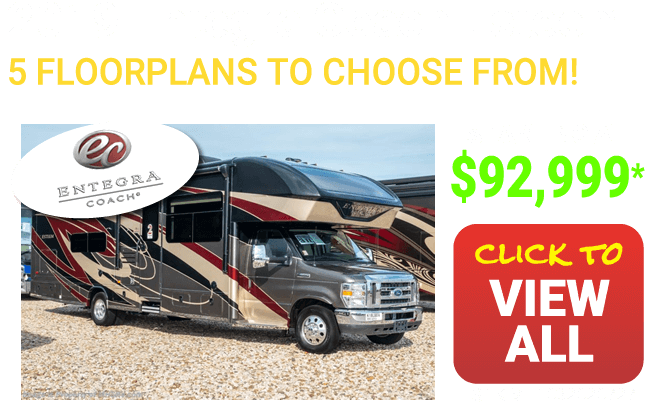 More about the Coachmen Mirada as of 2016MY. 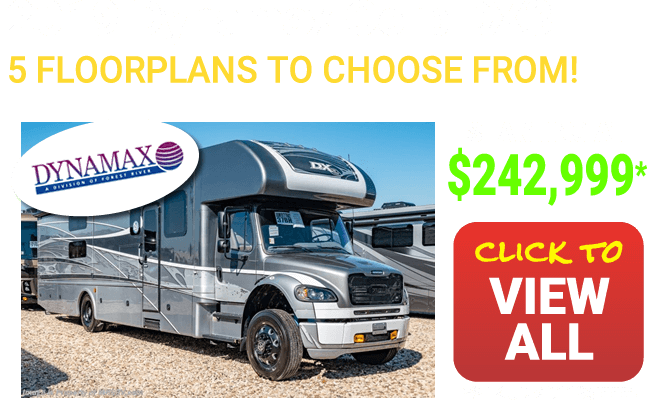 It is available in several popular floor plans including the 32UD, the 35LS bath & 1/2 model with extendable L-shaped sofa, a residential refrigerator, a mid-ship LED TV and fireplace. 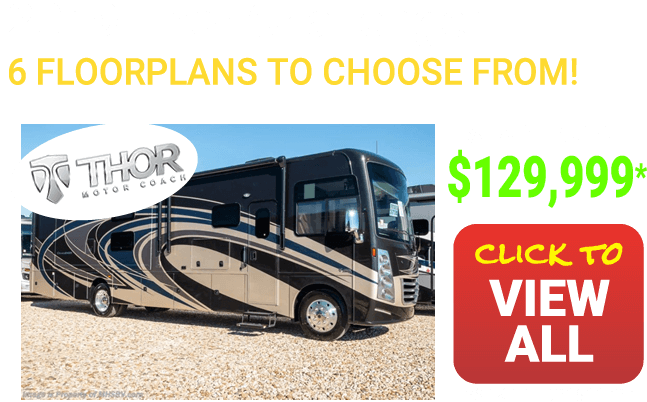 The 35KB with U-shaped dinette and sofa with dual dinette tables, a residential refrigerator, king sized bed and exterior entertainment center and kitchen complete with outside sink, refrigerator and grill and the all new 35BH Bunk House RV which is sure to become a family favorite here at Motor Home Specialist. 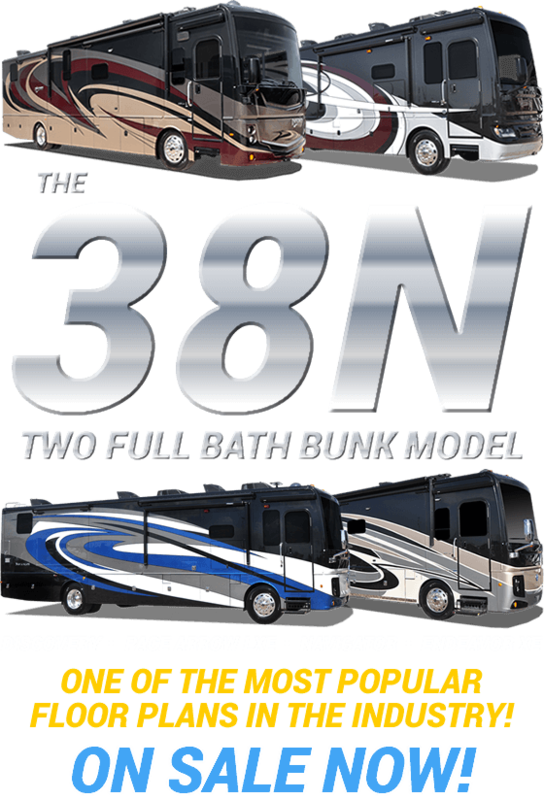 The 35BH Mirada floor plan is unique because it combines our two most popular floor plans by not only featuring hallway bunk beds, but is also a bath and a half model. Think of combining all the sleeping space of a bunk model, add to that a huge u-shaped dinette that easily converts into another sleeper, a full size hide-abed sofa/sleeper with seat belts, the optional power drop cab over sleeper with air mattress, and a master bedroom with queen bed and still have space enough for a full size master bathroom and half bath for your kids and guest. 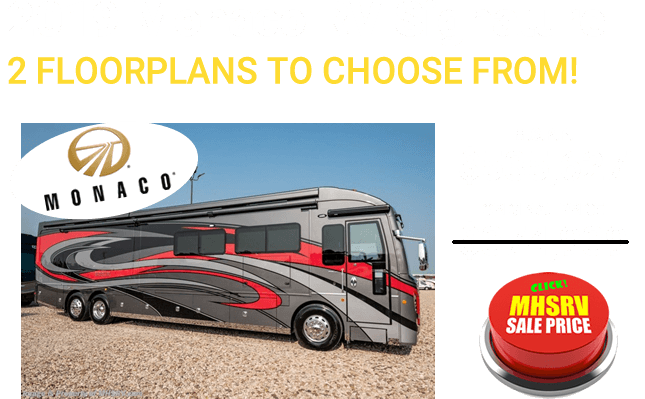 The 35BH is also now available with a stainless steel appliance package that includes a residential size microwave, 3-burner range and oven and is highlighted by the large residential sized refrigerator, Now couple all of these floor plan and feature benefits with the look, style and build of a Coachmen RV along with the incomparable savings found at Motor Home Specialist and the new Mirada just might be the right RV for you. Take a look at Mirada's incredible new front fiberglass cap with progressive styled headlamps with LED HALO and accent lighting, LED running lights and a huge one piece windshield with Coachmen's exclusive "Site Rite" dash that angles downward to provide a clear unobstructed view of the road. you'll also find Mirada's 3 camera coach monitoring system. The side cameras are blinker activated, so when you turn on your right hand blinker you can clearly see down the right hand side of the motor home, when you turn on your left blinker you’ll see clearly down the land hand side of the motor home. The back-up camera not only makes parking a breeze, but it's great to use just about any time you're driving. It makes it nice to be able to see the traffic coming up from behind you, as well as keep a close eye on your tow vehicle or trailer if your pulling something. These cameras can also be used for security purposes while you're camping. About the only thing you can't see from the driver's seat of the Mirada is what everyone else is admiring when you pass them bye.Take a look at Mirada's incredible new colored sidewall and partial paint package for 2016. This new option is incredibly popular and gives the new 2016 model Mirada a full body paint look at a fraction of the cost. But as beautiful as the exterior is it's what is behind the stripes that really separates the Mirada from its competition. The Mirada is built using the Azdel SuperLite composite side walls. Other products are built using traditional wood sheet sidewalls. The problem with wood is that it can absorb and retain moisture which will grow heavier over time and can ultimately cause wall separation or worse yet even mold. The Azdel product is lighter weight, which will help optimize your engine’s performance and fuel economy.It is also a smoother material, so it has a much better exterior look, and because it is not a wood material harvested from the rain forest it is both greener and provides a less that 1% chance of retaining any moisture that could ever lead to wall separation or mold. But no home is solid unless it is built on a strong foundation. And Coachmen RV provides that very thing. Every Mirada floor plan is a true full basement model and every basement is constructed using steel. and not just the cargo rails like a lot of other products, The cargo walls and even sub floors are all galvanized steel. The Mirada basement storage is further highlighted by this sheet of galvanized steel flooring creating a much stronger foundation and will help prevent pests or rodents from getting inside the unit. The Mirada 35BH model boast an incredible amount of exterior storage including several large pass through storage areas. You'll also find Ozite carpeting that helps protect and sound deaden each bay. The bay doors are side swing, feature a set of opposing bay doors for extra large items and ease of access and utilize slam latches for a superior door seal. It rides on a 22,000 lb Ford chassis and is powered by a 6.8L fuel injected Triton V-10 with a Best in class 362 HP, 457 ft. lbs. of torque and a heavy duty 5-speed automatic transmission. 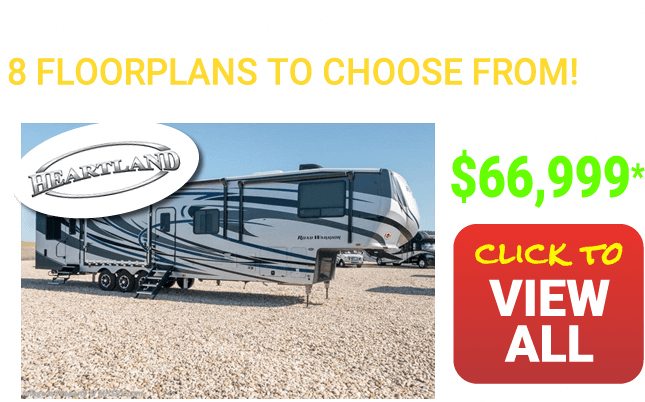 (This is subject to change and may be floor plan and even model year specific. Like every option or feature mentioned in this write-up, verify before purchase and OEMs and manufacturers can change anything including, but no limited to standard or even optional equipment. 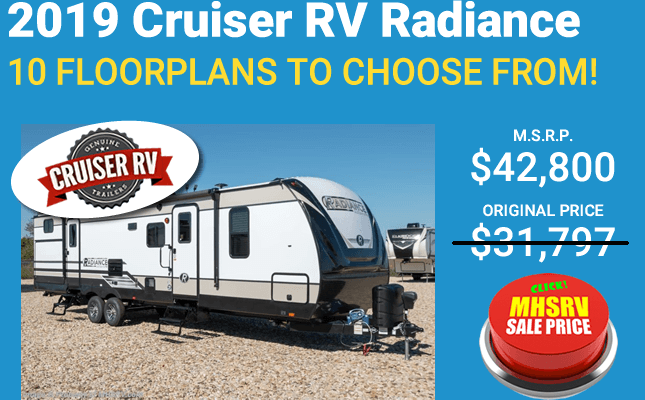 Other popular options & features you might find on the Mirada include a crowned and laminated fiberglass roof, power entrance steps, a magnum inverter for the residential refrigerator, chrome mirrors, slide-our room guiding system, fully enclosed and heated tanks, a rear ladder, a 5000 lb hitch, easy to access rear fuel fill, a 50 amp power cord, a 5500 Onan generator, slide-out room awning toppers, dual auxiliary batteries and a large LED exterior TV with separate DVD player. Even the Utilities bay in the Mirada is incredibly well appointed. The utilities bay features a whole coach water filtration system, a black water tank rinsing system, Coachmen's exclusive No-Mess termination system that really simplifies the process of dumping the black and grey water tanks and is much more sanitary than having to disconnect & store the sewer hose back inside the bay. The Mirada even has an exterior shower that really comes in handy for beach trips or washing the dog. 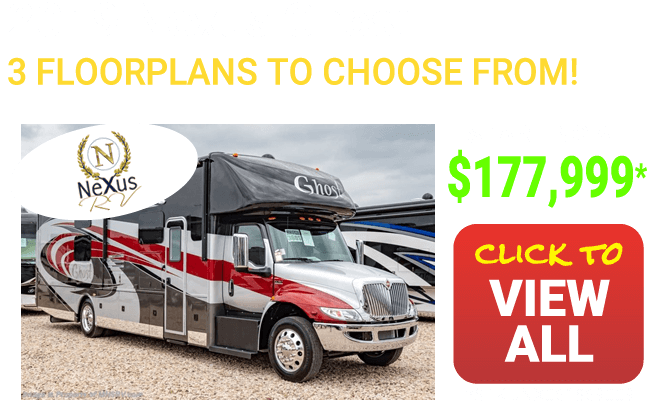 Once inside you can’t help but be impressed with the huge living areas created by the slide-out rooms, notice the tastefully designed furniture throughout the motor home including the captain’s chairs, the hide-a-bed sofa sleeper with seatbelts, and the large u-shaped booth dinette. Seatbelts can be found in the sofa as well as the booth dinette, and because the booth has seatbelts on both sides it's perfect for both a forward or rear facing child seat. And check out the family friendly cup holders in the sofa and booth helping keep the kids drinks out of the floor when traveling. You will also find two wood selections for 2016 models including the darker Spiced Maple and the all new Honey Glazed Maple. The kitchen is also incredibly well designed and appointed perfect for the RV lifestyle! Take a look at the deep overhead cabinet space as well as all the deep kitchen drawers with full extension heavy duty drawer glides. You'll also find two slide-out large pantries and beautiful solid surface counter tops and tile backsplashes. The kitchen also features a high arched faucet fixture, large sinks basins and solid surface sink covers as well as the beautiful stainless steel appliance package we mentioned earlier. Now one of the most popular features about the Coachmen Mirada 35BH floor plan is the large forward facing LCD TV. The forward facing design makes it possible to utilize the two front captain's chairs, the sofa and dinette areas when you're watching TV. Coachmen even went the extra mile when designing the Mirada's heating & air conditioning systems. The Mirada utilizes Coachmen's exclusive Even-Cool air conditioning system. The air flow from the dual 13,500 BTU A/C units are centrally distributed through a laminated & crowned fiberglass roof. The inner ductwork is heavily insulated and uses radiused corners to provide maximum cooling efficiency. The Mirada also has beautiful new cornice boards with matching fabrics as well as pull down day shades and black out night shades. The half bath feature in the 35BH model provides plenty of cabinet and counter space and is incredibly popular for couples and families alike. The master bath provides even more cabinet and counter space and is located in the very back of the motor home. This allows for maximum privacy and complete access to the master bedroom even when someone taking a shower. The master bedroom in the 35BH may also feature dual wardrobe closets, a chest of drawers, these deep overhead storage cabinets above the bed, nightstands with 110 outlets on both sides, and a queen sized bed, that even lifts up to reveal another huge storage area perfect for additional bedding and blankets. The bedroom also features this extra large LED bedroom TV that opens up to reveal yet another large hidden storage area in select models. And let's not forget about the hallway bunks in the 35BH floor plan. The bunks themselves feature privacy shades, large TVs and much more. Something else really cool about the Mirada's bunk bed design is that if you don't need the top bunk it easily folds up flush to the wall allowing this area to be used instead as a huge rear wardrobe closet. And I think you will really like what you might see once you get behind the wheel. Like the available controls for the automatic coach leveling system, power mirrors with heat, an emergency auxiliary start button, generator remote, 3-camera coach monitoring system, AM/FM stereo with CD player, cab A/C & heat, cruise control, tilt wheel, push button tow & haul mode & a digital information display. 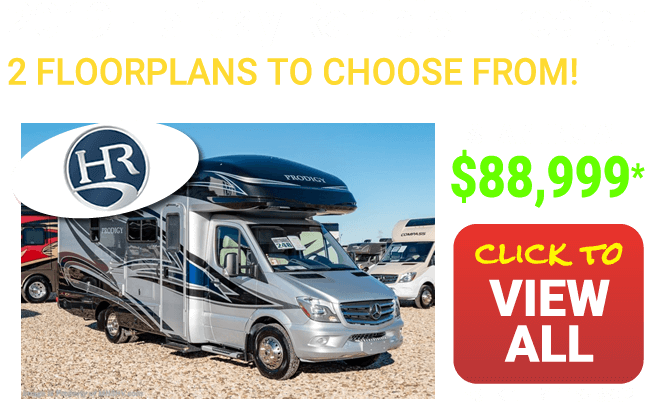 And when you purchase any new Coachmen RV from Motor Home Specialist you will not only enjoy superior service, selection & pricing, but also receive a free 1 year membership in the Coachmen Owners Association. 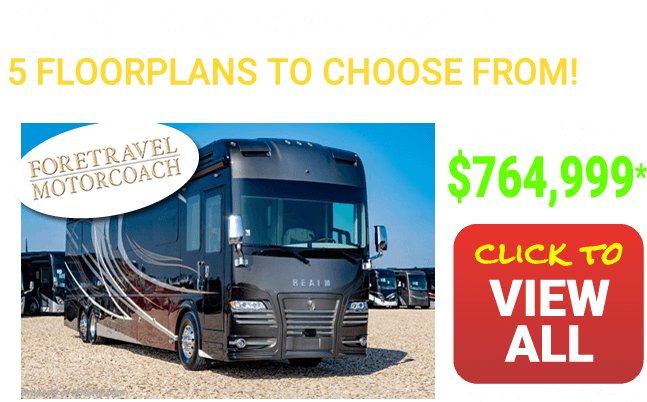 This added value not only provides a host of travel services and campground discounts, but also 24/7 online service that locates needed services while offering savings at more than 180,000 merchants across the country. Coachmen RVs origins date all the way back to 1964. Recently they became part of Forest River and the world famous Berkshire Hathaway group. Berkshire Hathaway's current list of companies include some of the most well know in the world. 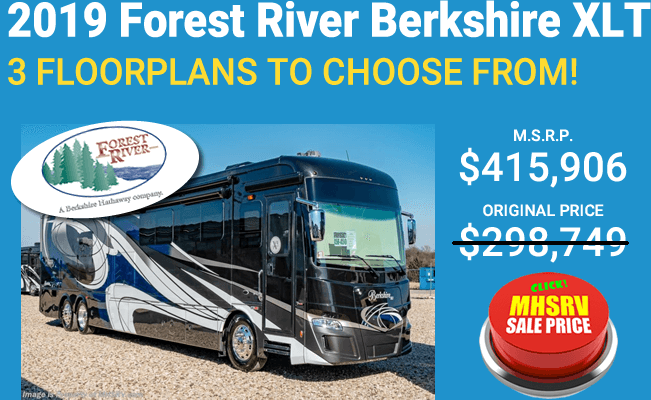 Forest River has over 60 plants nationwide manufacturing more than 80 different makes of trailers, 5th wheels, boats, cargo trailers, manufactured & modular homes, commercial vehicles, shuttle buses and of course luxury class C, Class A gas & diesel pusher motor homes. 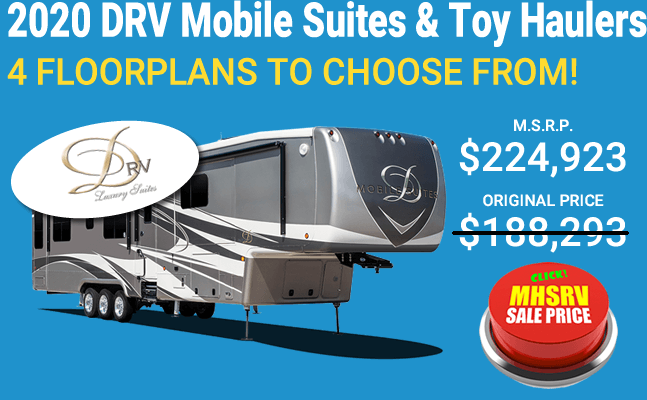 Click here to view Coachmen Mirada RV Reviews.